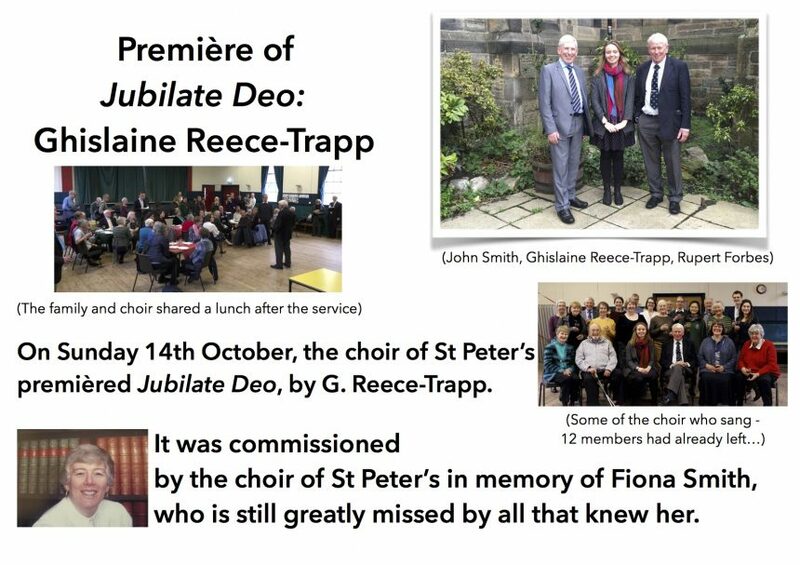 On Sunday 14th October, many friends, family and congregation joined to hear the St Peter’s Choir sing the prèmiere of Jubilate Deo, by Ghislaine Reece-Trapp. It was commissioned by the choir in memory of Fiona Smith, who is still greatly missed by all that knew her. We were delighted that the composer was present too. The energetic and moving Jubilate Deo truly reflected Fiona’s wonderful and ebullient character. This is the Live performance of the Prèmiere: Conductor: Rupert Forbes, Organ: Sheila Chisholm, Soprano Solo: Angus Gibson, Alto Solo: Christine Bethune, The Choir of St Peter’s, Lutton Place.